1. North Sunland Region: North of Foothill Boulevard, from the western STNC domain boundary east to Mount Gleason Avenue and Big Tujunga Canyon Road. 2. North-West Tujunga Region: North of Foothill Boulevard, from Mount Gleason Avenue and Big Tujunga Canyon Road to Commerce Avenue and Seven Hills Drive. 3. North-East Tujunga Region: North of Foothill Boulevard, from the eastern STNC domain boundary west to Commerce Avenue and Seven Hills Drive. 4. 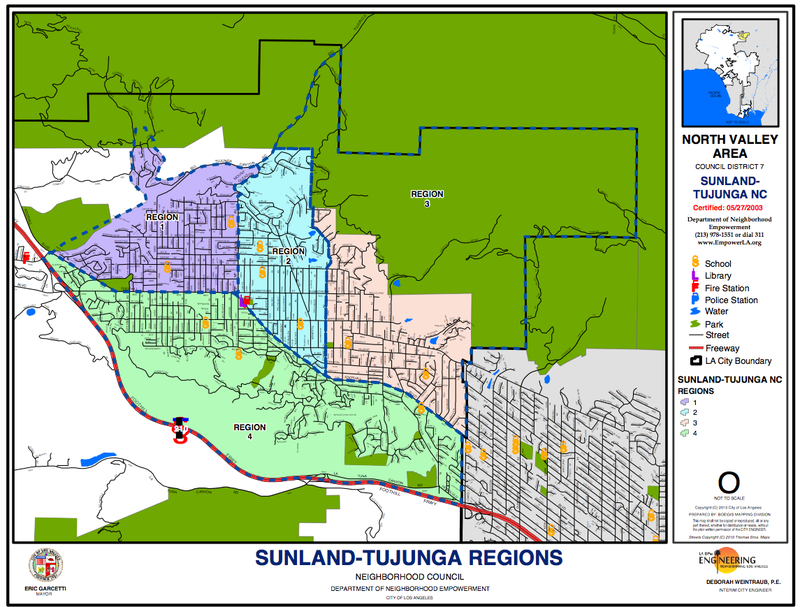 South Sunland - Tujunga Region: South of Foothill Boulevard.